Authentic NATURE STONE® Brand Flooring is the ideal floor covering for demanding environments in commercial and industrial buildings. 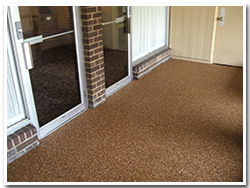 Its strength, toughness and durability make NATURE STONE® Brand Flooring ideal for harsh environments. With a load limit up to 25,000 PSI, NATURE STONE® Brand Flooring can be used just about anywhere with exceptional performance and long-lasting beauty. NATURE STONE® is an internationally registered trademark of O.C.R. Products, Inc. Offers apply to corporate owned and operated locations only. Dealer offers, terms and conditions may vary. Please check with your local NATURE STONE® Dealer for special offers or discounts in their respective markets.